The charset encoding (ISO-8859-1) is set correctly. 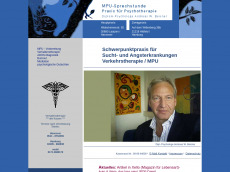 Test up to 1.000 webpages of mpu-psychologische-praxis.de with our free plan! There are only 74 words on this page. Use at least 250 words to provide useful information. The page response time is excellent with 0.01 seconds. This website only has 10 backlinks.